The involvement of World Cup star Jamie Roberts coupled with the return of live BBC coverage meant the Varsity Match received more publicity than usual this year, but the Oxbridge rugby event also proved a great success off the field. With Leonard Cheshire Disability selected as official charity partners for the game, a fundraising target of £40,000 will go towards making life changing additions, including new ‘eating aids’, to some of the charity’s care homes. The innovate technology enables people with conditions including cerebral palsy, multiple sclerosis and motor neurone disease to eat independently and safely. Supporting independent living is at the heart of everything our charity does. “Varsity is a real occasion so the partnership with Leonard Cheshire Disability has proved a great match-up,” said former England international Alastair Hignell, who represented Cambridge at Varsity on four occasions. 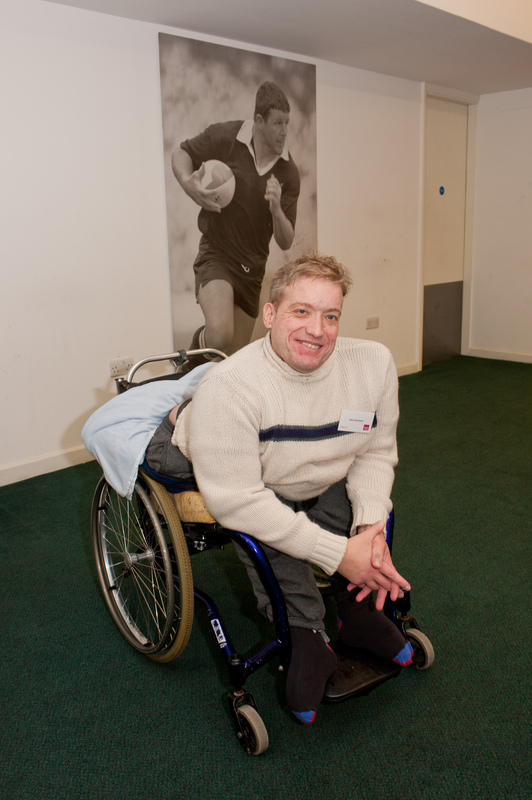 Alastair, who lives with Multiple Sclerosis and is now a trustee for the charity, hosted a prize auction at Twickenham alongside legendary BBC commentator Ian Robertson, known as the ‘voice of rugby’. “We thank everyone for their generosity at the auction and around the ground, where our volunteers had their collection buckets filled,” added Alastair. Disabled residents from care homes across the country were given free tickets to the game, the 134th Varsity Match staged in what is the longest running fixture in amateur rugby. “The Leonard Cheshire home where I live is great for giving us sporting opportunities,” said David Sommers, 38, who lives with spina bifida and is a resident at The Manor in Cambridgeshire.